Dressing you up to make a good impression! Promotional or branded clothing is an easy and cost effective way to promote your company, business or club. When worn by your staff it creates an image of professionalism and makes a lasting first impression. Our online catalogue has anything you might want to make your team stand out from the crowd… we have a wide range of uniforms, workwear, leisurewear and sportswear, along with corporate wear and durable outdoor casual wear. There’s t-shirts, polos, caps, fleeces, hoodies and jackets for every occasion! Personalised clothing serves a huge range of purposes and we cater for all of them, from hen & stag parties, to sports clubs to staff uniforms and corporate wear. Promotional clothing is a very effective means of spreading awareness about your business. When you’re out and about, just look around and see the amount of branded apparel you can spot! Logos and branding are everywhere to be seen. 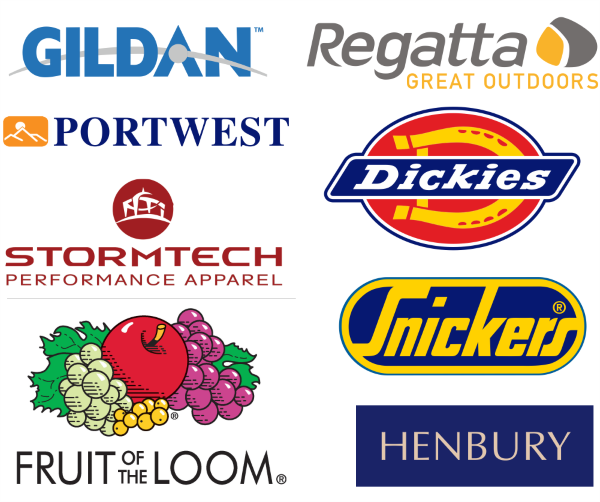 With promotional clothing, your company’s name and message is always on the move. Choose from these great brands and many more! Enjoy the benefits of personal service! Because we like the personal touch and every order is different, we operate a ‘wish list’ where you get to submit the items that you would like to know more about. It gives us the opportunity to assist you directly, giving you our best price and help with your branding options. If you need help making a selection, call us… we’ll be delighted to hear from you!